California's wildfire woes continue to escalate as the Mendocino Fire Complex, which consists of two, gradually merging blazes known as the Ranch Fire and the River Fire, exploded in size over the weekend to become the state's second-largest wildfire on record — behind last year's Thomas Fire. The big picture: California is enduring another deadly wildfire year with eight large fires burning Monday. The Mendocino Fire Complex stood at 273,664 acres on Monday morning and was only 30% contained. The blaze spread smoke across San Francisco, leading to an eerie sunrise. The fire complex may soon become the largest fire ever recorded in the Golden State, as a heat wave continues to bake the length of the state while historically dry vegetation stands ready to burn. To put its size in perspective, the Mendocino Fire Complex is about 19 times larger than the island of Manhattan and is about 1.25 times larger than the city of Dallas. When considered separately, the Ranch Fire alone has jumped to 201,000 acres — enough to put it on the state's top-10 largest fires list. Last year, the Thomas Fire burned 281,893 acres in Ventura and Santa Barbara Counties. Given the opportunity for the Mendocino Fire Complex to continue to expand, it's likely that it will take the top spot in terms of acres burned. It's no accident that the majority of the largest fires — 14 out of the top 20 — have occurred since the year 2000. Decades of fire suppression policies that have left forests with thicker vegetation cover than they otherwise would have had. Land management practices that have encouraged or allowed humans to build close to or inside the areas that typically would see wildfires relatively frequently, known as the Wildland Urban Interface. Long-term drought, which has dried soils and vegetation and killed millions of trees, leaving them vulnerable to fires. Climate change, which has increased temperatures, worsened drought conditions and further dried out vegetation. Study after study has shown that global warming is already making wildfires larger in many Western states and is lengthening fire seasons as well. As the climate continues to warm, extreme heat events and drought are increasingly likely in the West, making wildfire conditions even more dangerous. The bottom line: California is experiencing more of its largest fires on record — well before the typical peak in the state's wildfire season, which tends to come in October. Because of the factors listed above, wildfire season now lasts all year in California and many other Western states. 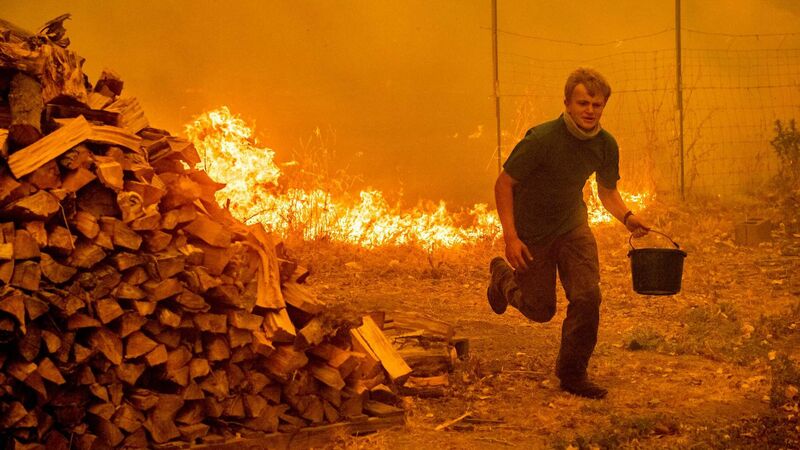 California's "fire tornado" had 143 mile-per-hour winds. Trump claims California wildfires "made so much worse" by environmental laws. How the Carr Fire morphed into a towering, deadly "fire tornado."